Welcome to the Michigan High School Tennis Coaches Association's web site. We hope you will find this media informative, easy to use, and a source of continuous support to tennis coaches around the State. We would appreciate any constructive criticism and ideas you may have to improve this service. As with many web sites, we emphasize that this is "under construction". We will build on your ideas and our own as time permits. The main purpose of this site is to improve our communication with our members and to encourage more coaches to join our Association. If you click on any of the topics listed in the left column, you will be taken to information pertaining to that topic. Have fun!! Let us know what you think. Richard Bradley’s volunteer service began at the grassroots level in his community and extended through different levels at the USTA with an emphasis on promoting and growing junior tennis. Bradley believed that tennis could have a powerful impact in local communities and in the lives of children. At the USTA level, Bradley volunteered for the USTA/Midwest Section for 13 years, serving as chairperson of the Section’s Junior Competition Committee and Multicultural Participation Committee. He later served on the USTA/Midwest Section Board of Directors for four years, and was eventually elected as a Delegate-at-Large on the Executive Committee. At the local level, Bradley was very active in the Chicago District Tennis Association, serving in volunteer and leadership roles for approximately 20 years, which included time on the Chicago District Board of Directors. 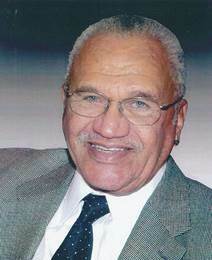 He was elected President of the Chicago Prairie Tennis Club in the early 1980s serving for several years. Bradley was elected President of the American Tennis Association in 1994 and served for approximately six years. He also was President of the Midwestern Tennis Association (MID-TAC), the Midwest Section of the American Tennis Association, for approximately eight years. Through his involvement with the Greater Chicago Community Tennis Association, Bradley became a mentor to former professional tennis player Katrina Adams during her junior career growing up in Chicago. The Richard Bradley Memorial USTA/Midwest Section Scholarship was established by the USTA/Midwest Tennis & Education Foundation in partnership with former tennis professional Katrina Adams in 2014. Each year, a $2,500 Richard Bradley Memorial USTA/Midwest Section Scholarship will be presented to one junior tennis player from the USTA/Midwest Section. The scholarship is designed to provide assistance to those who have demonstrated financial need, and have shown ability and aptitude as students and as tennis players. Submit a completed application packet. Please note: If the award of the Richard Bradley Memorial USTA/Midwest Section Scholarship to an applicant would result in the reduction of the amount of an academic or athletic scholarship(s) awarded to the applicant by a college or university, then the applicant is ineligible to receive this scholarship. Applicants must verify that the receipt of the Richard Bradley Memorial USTA/Midwest Scholarship will not result in the reduction of any academic or athletic scholarship from their college or university. The USTA/Midwest Tennis & Education Foundation, the charitable and philanthropic entity of the USTA/Midwest Section, is dedicated to supporting youth tennis programs and activities throughout the USTA/Midwest Section. It supports community tennis programs for youth of all ages, skills and backgrounds. Grant opportunities for individuals are also available. The USTA/Midwest Tennis & Education Foundation now supports specific adult populations, namely adaptive tennis and wheelchair tennis programs, as well as programs for disabled veterans and their families. Grant opportunities for programs servicing these adult populations are available. The Indianapolis-based USTA/Midwest Section exceeds more than 60,000 individual members and 700 organization members. It is the second largest section of the United States Tennis Association (USTA), the national governing body for tennis in the U.S. The USTA/Midwest Section is comprised of 13 Districts in the following states: Illinois, Indiana, Michigan, Ohio and Wisconsin, as well as designated counties in West Virginia and Kentucky. The mission of the USTA is to develop and promote the growth of tennis. The mission of the USTA/Midwest Section is to promote, grow, develop and service the game of tennis. A committee appointed by the President of the USTA/Midwest Tennis & Education Foundation evaluates the applications and makes recipient recommendations for the Richard Bradley Memorial Scholarship. The recommendations are presented to the USTA/Midwest Tennis & Education Foundation Board of Directors for final approval. The recommendations and final approval will be made without regard to the applicant’s race, color, ethnic origin, religious belief, sexual orientation, or physical handicap. 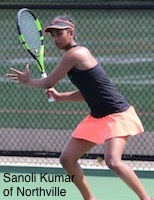 The recipient of the scholarship is contacted by the President of the USTA/Midwest Tennis & Education Foundation. Each recipient of the Richard Bradley Memorial Scholarship is recognized on the USTA/Midwest and USTA/Midwest Tennis & Education Foundation websites as well as other social media. All completed applications and required additional documents must be postmarked by March 22, 2019. Applications must be submitted on forms identified by the year in which the awards will be made. Applicants will be notified regarding the status of their application in April 2019. If you have any questions or need any additional information, please contact the USTA/Midwest Tennis & Education Foundation at 317-669-0465 or send an email to kathy@midwest.usta.com. The 2019 Coaches' Directory is posted to the website. The directory is password protected. In March 2019 the current password was emailed to all members that listed email addresses. If you can not access the Directory, you may not have renewed your membership for 2019. Please check to make sure that your information is correct and send any corrections to Bruce Grotenhuis (see below). The link below contains an MHSTeCA Tribute. For so many of you, it, too, will elicit some fond memories. For those who have never met the man, this should be Required Reading. University Liggett School will host a memorial service on Sunday, May 19th at 11:30. Donations to the Robert G. Wood Endowment Fund can be sent to the Development Office at 1045 Cook Rd., Grosse Pte Woods MI 48236. Checks should be made out to University Liggett School with “Wood Scholarship Fund” in the memo. Four generations of the Wood family attended or are currently attending the school. Click here to read tribute to Bob. The USTA, Southeastern District, has a couple of scholarships they want you to be aware of. Please pass the info on to your players. The MHSAA has made arrangements to use an online scoring program called Tennis Reporting. This program will be free of any cost to you and your school. Starting with the 2018 Fall Season it will be mandatory. Click on a link below to view the program. The MHSTeCA's Mr Tennis award is given to a Number One Senior Singles player. Each Division nominates one player from their Division and then one of those is chosen Mr Tennis. The following players were nominated for Mr Tennis for Fall 2018. Andrew Zhang of Bloomfield Hills. 2010 - Joe Dube, Detroit Catholic Central. 2009 - Aaron Pfister, Grand Blanc. The MHSTeCA's Miss Tennis award is given to a Number One Senior Singles player. Each Division nominates one player from their Division and then one of those is chosen Miss Tennis. The following players were nominated for Miss Tennis for Spring 2018. MHSTeCA is now on FaceBook. If you have a facebook account, just type in Michigan High School Tennis Coaches in the white space near the top of your 'page' (says Search in the space). Click on Request to Join 'button' and you should get approval shortly. If you are not on facebook, go to www.facebook.com and set up an account. Coaches - The MHSTeCA's 2015 Fall Newsletter is on available. 1. Each head coach of a varsity team in a sport under MHSAA jurisdiction shall complete (in person or online) the MHSAA rules meeting for that sport for the current school year prior to the deadline if meetings are provided and attendance is required. If the head coach does not complete a rules meeting prior to the deadline, that coach shall be prohibited from coaching in that season's MHSAA tournament for the sport involved and shall not be present at the facility where the MHSAA tournament involving that coach's team is being held. An administrator or faculty member designee of that school shall be present with supervisory capacity over the school's competitors. Failure to receive reminder notifications (email or other) does not change the requirement of this Section. 2. Schools shall attest that all assistant and sub-varsity coaches have completed an MHSAA rules meeting (online or in person) for that sport for the current school year prior to the deadline or, in the alternative, one of the free online sports safety course posted on or linked from MHSAA.com and designated to fulfill this requirement. If an assistant coach does not complete a rules or safety meeting prior to the deadline, that coach shall be prohibited from coaching in that season's MHSAA tournament for the sport involved and shall not be present at the facility where the MHSAA tournament involving that coach's team is being held. • NFHS "Creating a Safe and Respectful Environment"
• NFHS"A Guide to Heat Acclimatization & Heat Illness Prevention"
• NFHS "A Guide to Sports Nutrition"
4. 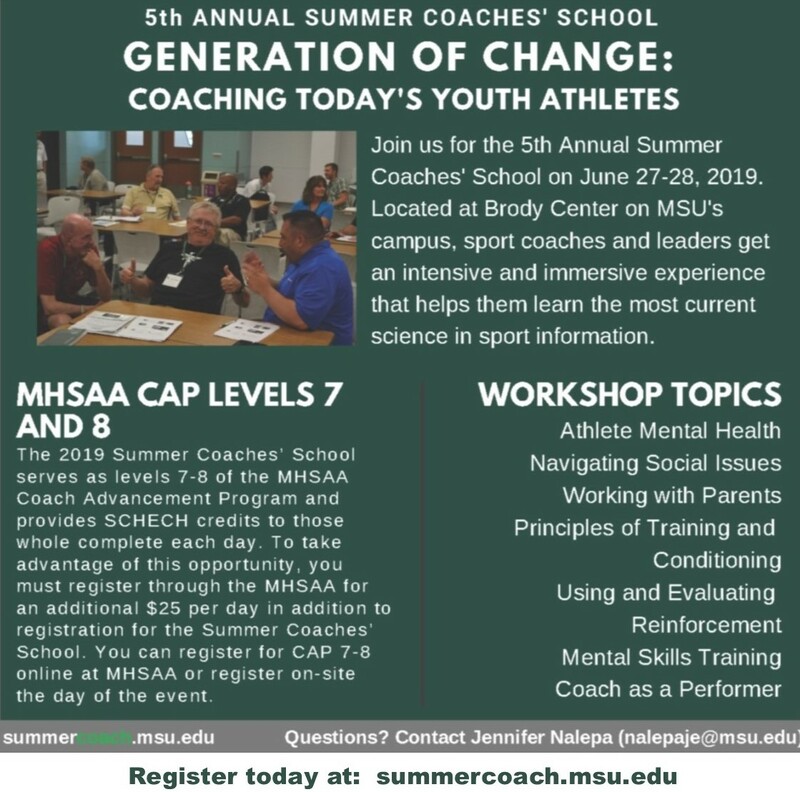 Effective with the 2016-17 school year, each head coach of a varsity team in a sport under MHSAA jurisdiction hired for the first time at any MHSAA member school after July 31, 2016 shall have completed either Level 1 or Level 2 of the MHSAA Coaches Advancement Program (CAP). If the head coach does not complete CAP Level 1 or 2 prior to the established deadline, that coach shall be prohibited from coaching in that season's MHSAA tournament for that sport involved and shall not be present at the facility where the MHSAA tournament involving that coach's team is being held. MHSTeCA now has a written procedure for adding new members to its Board of Directors. Click here to check on this process. All contributions will be tax-deductible.